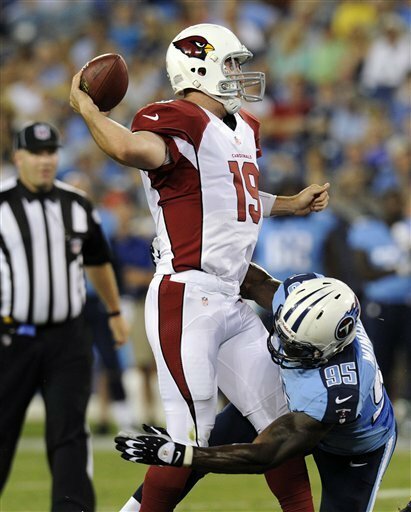 Jake Locker showed why the Tennessee Titans picked him as their starting quarterback. The Arizona Cardinals leave town still trying to figure out their own situation after neither John Skelton nor Kevin Kolb looked very impressive. 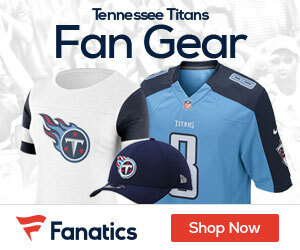 Locker threw for 134 yards and two touchdowns in his home debut as Tennessee’s starting quarterback, and the Titans beat the Cardinals 32-27 on Thursday night. Tennessee named Locker, the eighth overall draft pick in 2011, their starter for the season on Monday. He responded by throwing for 124 yards and both TDs in giving Tennessee a 17-10 halftime lead and finished 11 of 20 for 134 yards with a 109.2 passer rating. He got plenty of help as the Titans (No. 21 in the AP Pro32) got another strong showing on defense. End Kamerion Wimbley had two sacks, linebacker Colin McCarthy returned one of his two interceptions 31 yards for a TD and the Titans (2-1) forced five turnovers overall. Returner Marc Mariani broke his left leg at the end of a punt return. The Cardinals (No. 23) struggled without left tackle Levi Brown, who tore his right triceps in Arizona’s 31-27 win over Oakland last week. Skelton, who started at quarterback for Arizona (1-2), lasted until early in the second quarter. Skelton got the start as the Cardinals try to decide between him and Kolb. Ryan Lindley only had a fumble as he threw for 112 yards and nearly pulled out a win until his pass into the end zone was batted away at the end. But Skelton couldn’t have started much worse. Wimbley sacked him on the Cardinals’ first offensive play. Then safety Michael Griffin intercepted his pass on the next play, returning it 24 yards after fumbling the ball. Skelton played one series – a three-and-out – into the second quarter and was 4 of 10 for 41 yards with a 12.9 passer rating. Arizona trailed 17-3 and had only 69 yards offense until Kolb found Larry Fitzgerald on a 53-yard pass to start an 86-yard drive capped with his 3-yard TD pass to Andre Roberts. Wimbley also sacked Kolb on his first offensive play. Kolb finished 17 of 22 for 156 yards with a TD but two interceptions – both by McCarthy, the second-year middle linebacker out of Miami. McCarthy picked off a pass by Kolb late in the second quarter and intercepted Kolb’s first pass 14 seconds into the third quarter that he ran back untouched for a TD. The Titans turned safety Michael Griffin’s interception into Locker’s first TD this preseason. He found rookie Kendall Wright on the right sideline for a 10-yard TD pass for a 7-0 lead. Locker overthrew a couple of receivers, including 6-foot-5 tight end Jared Cook who stretched out for a nice 35-yard catch he could have taken for a TD if thrown better. He found Nate Washington on a crossing route for a 28-yard TD pass in an 80-yard drive he helped keep by scrambling twice for 11 yards.